Even as he awaits the release of Duvvada Jagannadham, Allu Arjun will soon be launching his next film in writer Vakkantham Vamsi’s direction. The film was titled Naa Peru Surya initially. But when the makers announced that they will reveal the film’s title today, speculations were rife that there will be a change in the title as Bunny was not happy with Naa Peru Surya . This morning, the makers revealed the title and there are no surprises. 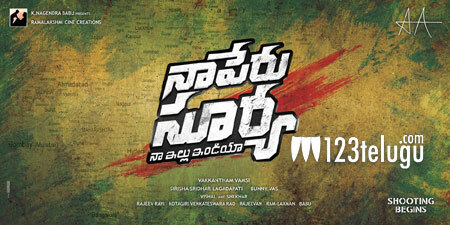 The old title ‘Naa Peru Surya’ with the tagline ‘Naa Illu India’ has been retained for the film. Allu Arjun is rumored to be playing a Jawaan in the movie as the film will have a rich patriotic flavor. The film will be produced by Lagadapati Sridhar. Acclaimed technicians such as Rajeev Ravi as the DP, Vishal-Shekar as music composers and Rajeevan as the production designer are part of the film’s crew.